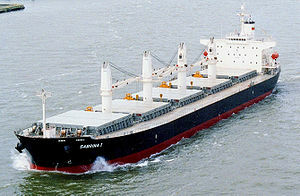 The loading method used depends on both the cargo and the equipment available on the ship and on the dock. In the least advanced ports, cargo can be loaded with shovels or bags poured from the hatch cover. This system is being replaced with faster, less labor-intensive methods.Double-articulation cranes, which can load at a rate of 1,000 tons per hour, represent a widely used method, and the use of shore-based gantry cranes, reaching 2,000 tons per hour, is growing. A crane's discharge rate is limited by the bucket's capacity (from 6 to 40 tons) and by the speed at which the crane can take a load, deposit it at the terminal and return to take the next. 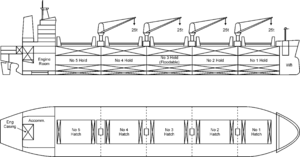 For modern gantry cranes, the total time of the grab-deposit-return cycle is about 50 seconds. DOC, mémoire de DESS, 1999. Chisholm, Hugh, ed. (1911). "Ship" . Encyclopædia Britannica. 24 (11th ed.). Cambridge University Press. p. 881.